The organ pipe mud dauber, one of many mud daubers in the family Crabronidae, as the name implies, builds nests in the shape of a cylindrical tube resembling an organ pipe or pan flute. Organ-pipe mud daubers build their very distinctive and elegant tubes on vertical or horizontal faces of walls, cliffs, bridges, overhangs and shelter caves or other structures. 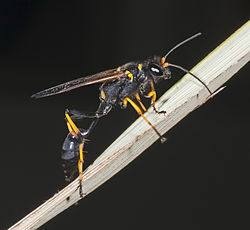 The nest of the black and yellow mud dauber, one of many mud daubers in the family Sphecidae, is composed of a series of cylindrical cells that are plastered over to form a smooth nest about the size of a lemon. Black-and-yellow mud daubers build a simple, one-cell, urn-shaped nest that is attached to crevices, cracks and corners. Each nest contains one egg. Usually, they clump several nests together and plaster more mud over them. The metallic-blue mud dauber, another sphecid, forgoes building a nest altogether and simply uses the abandoned nests of the other two species and preys primarily on spiders, including black widow spiders. Blue mud daubers frequently appropriate old nests of black-and-yellow mud daubers. They carry water to them and recondition them for their own purposes. The two species commonly occupy the same barns, porches, or other nest sites. One disadvantage to making nests is that most, if not all, of the nest-maker’s offspring are concentrated in one place, making them highly vulnerable to predation. Once a predator finds a nest, it can plunder it cell by cell. A variety of parasitic wasps, ranging from extremely tiny chalcidoid wasps to larger, bright green chrysidid wasps attack mud dauber nests. They pirate provisions and offspring as food for their own offspring. Like most other wasps, mud daubers are predators. The females not only build the nests, but also they hunt to provision them. However, pipe-organ mud dauber males have reportedly brought spiders to the nest, and they aid in nest guarding. Adults of both sexes frequently drink flower nectar, but they stock their nests with spiders, which serve as food for their offspring. Like connoisseurs, they prefer particular kinds of spiders, and particular sizes of spiders for their larders. Instead of stocking a nest cell with one or two large spiders, mud daubers cram as many as two dozen small spiders into a nest cell. They appear to know exactly what they are hunting for, and where to find it. To capture a spider, the wasp grabs it and stings it. The venom from the sting does not kill the spider, but paralyzes and preserves it so it can be transported and stored in the nest cell until consumed by the larva. A mud dauber usually lays its egg on the prey item and then seals it into the nest cell with a mud cap. It then builds another cell or nest. Missouri’s mud daubers generally have two generations per year. The young survive the winter inside the nest. There are many species of mud dauber wasp. Here are some characteristics for mud daubers of the Sceliphron genus. Face covered by dense golden hair; no yellow integumental patch on lower face. Thorax dorsally with at least one yellow patch medially between wing-bases. Hind part of thorax with yellow patch just above insertion of abdominal petiole but lacking paired spots. Abdominal gaster yellow basally and apically. Face with a covering of golden hair, sparse ventrally; lower face with a yellow integumental patch medially. Thorax dorsally with a yellow patch between wing bases. Hind part of thorax with a yellow patch just above insertion of abdominal petiole and four other yellow spots. Abdominal gaster yellow basally and apically.